This title was suggested by the shop of my ereader and I got it out of curiosity. “The Norroena Society Presents: The Nature Of Asatru; an overview of the ideals and philosophy of the indigenous religion of Northern Europe”. The Norroena Society? That does not ring a bell. It appears to have been a Scandinavian publishing house from the early 1900’s, the current society leans on the original one. Puryear uses the word “Asatru” a lot, but also “Odinist”. Puryear seems to be involved in Asatru Nation, one of the two offshoots of Stephen McNallen’s Asatru Free Assembly (McNallen later founded the Asatru Folk Assembly). Towards the end of the book Puryear refers to Alexander Rud Mills who “established” Asatru in Australia “around the turn of the 20th century” and “Else Christensen [who] would later spread it to the Americas beginning in the late 1960’ies”; thus we are talking about the Odinic Rite. The book might seem to be a beginner’s guide to Asatru, but contrarily, I would not recommend it to people new to Asatru, rather to people who have been familiar with or involved in it for some time. The reason for this is because the author has many peculiar references to “the lore” and odd interpretations of some concepts. Leikin is the real name of Urd’s daughter, Idun was in exile with Völund-Thjazi, Hel was a place of bliss while Niflhel is the hell for the damned and the Gods daily meet during the Helthing to send the dead to either Valhall, Hell or Niflhel, ancient Teutons believed in reincarnation; just a few examples. Puryear writes as if Asatru is a homogonous community and (incidentally or not) that his book represents the whole of Asatru ‘philosophy’, but I think many might raise an eyebrow about the many pages that Puryear spends to subjects of ethnicity, race, the duty of Asatruar to secure the Nordic race and the like. On the other hand, because this is no subject which is entirely black and white, Puryear keeps stressing that Asatru is about honour and respect and respect certainly stretches to other people, whether Asatru, Christian, Muslim or something else. Anyone is entitled to make his/her own choices. Asatru has to be lived and as Asatruar live respectfully they can be an example for other people (of whatever background or religion) and the prejudices about the ancient history of Northern Europe might slowly disappear. Puryear’s book certainly raises some questions marks, here and there an eyebrow and sometimes a smile, but it also presents things to think about whether you are Asatruar or not. Also some known elements uplighted from another side can put things in new perspectives. Therefor I can say that the book might not perhaps not be a ‘neutral’ introduction of Asatru at large, but could be a start to more thoroughly think over the ancestral path. No two Ásatrúar will think alike, as it should be. Many of the ideas presented in this book may be subject to scrutiny, for my views may not be the same as those of others. But my aim here is solely help people understand the basic concepts of Ásatrú, in hopes of rekindling the ancient fire in the heart of our folk as we shine new light on this ancestral belief. I work in a correctional institution in Alabam and one of our residents requested of me some information in hopes of contacting the author of this book. I did a little research and discovered that in the prison community these subjects are sometimes affiliated with white supremecy and specificaly the aryan brotherhood. I am also a 12-stepper and big on “God as you understand him” and I am a student of comparative religion. I consider myself to be very open minded and see beauty in many different expressions of spirituality. That is not to imply that this particular author is in any way affiliated with intolerance or (in my humble opinion) negative ideology but based upon your review of this book I was wondering if you had any suggestions as to material of this genre that might be conducive to tolerance and love and spiritual growth that I could provide this resident. “Asatru”, and “heathenism” / “paganism” in general are vague terms used by many people in many different contexts. I use it roughly as an umbrella term for Northern-European heathenry. Americans seem to tend to see Asatru as one specific form of the same. I am not totally familiar with the American ‘pagan scene’, but there are different Asatru groups, people who calls themselves “Odinists”, þeods and whatnot. When you click on the “Asatru” link below the title of the review you commented on, you will find a lot more books in the vein. Since you are interested in comparative myth you might want to find the books of Georges Dumézil (specifically “Gods Of The Ancient Northmen“) or the books of Ellis Davidson or Mircea Eliade. It looks like you are more looking for a contemporary book about contemporary paganism? I do not, on top off my head, know the perfect book. In a descriptive direction, you could try to find “Modern Paganism In World Cultures“. I do not know if it is currently in print. 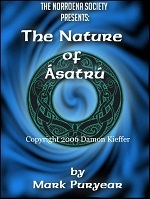 Contemporary of and about paganism (and in English) you rapidly run into books from specific groups, such as the Asatru Folk Assemby (not entirely undisputed) or the Runegild. Perhaps the best choice from my own website could be “Hammer Of The Gods“. This is also from a specific form of American paganism (þeodism), but this book is fairly well written. Perhaps an endnote. Did you know that there are several heathen organisations in the USA (I believe the Asatru Folk Assembly is one of those) who can actually minister (or how do you call it) in prisons? Perhaps it could be interesting to found out what programs they run.